"Orange You Glad it's Christmas?!" 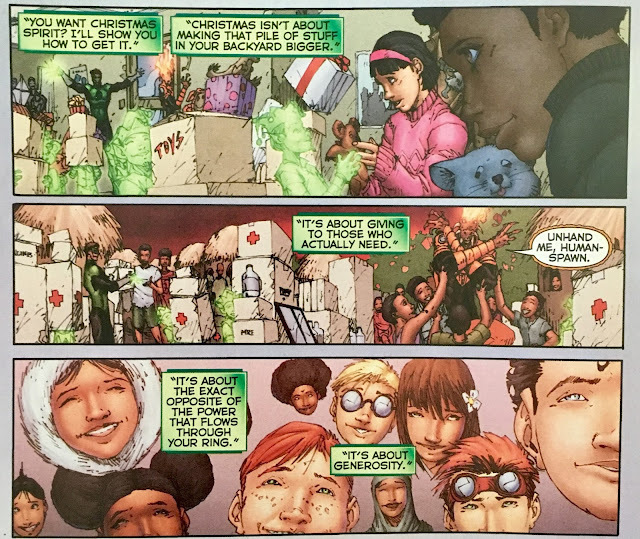 Welcome to the Second Day of Christmas on Infinite Earths! Today Santa Chris is going to chat up the Larfleeze Christmas Special from ye old 2011. Hell, that was several realities ago by this point! 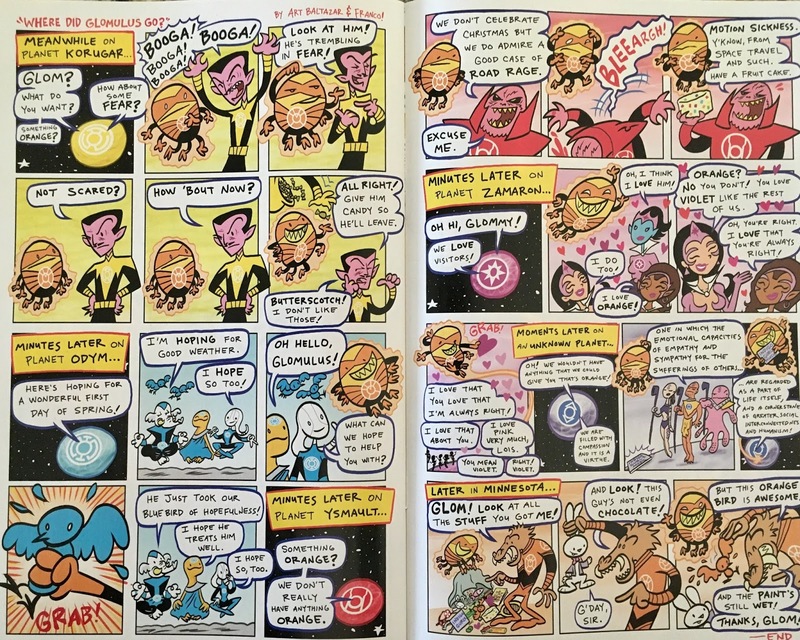 This discussion comes with a ***WARNING***, however... this might not be the post (or book) you read with your young children. Nothing raunchy... but, let's just say the content is a bit "mature". Get it? 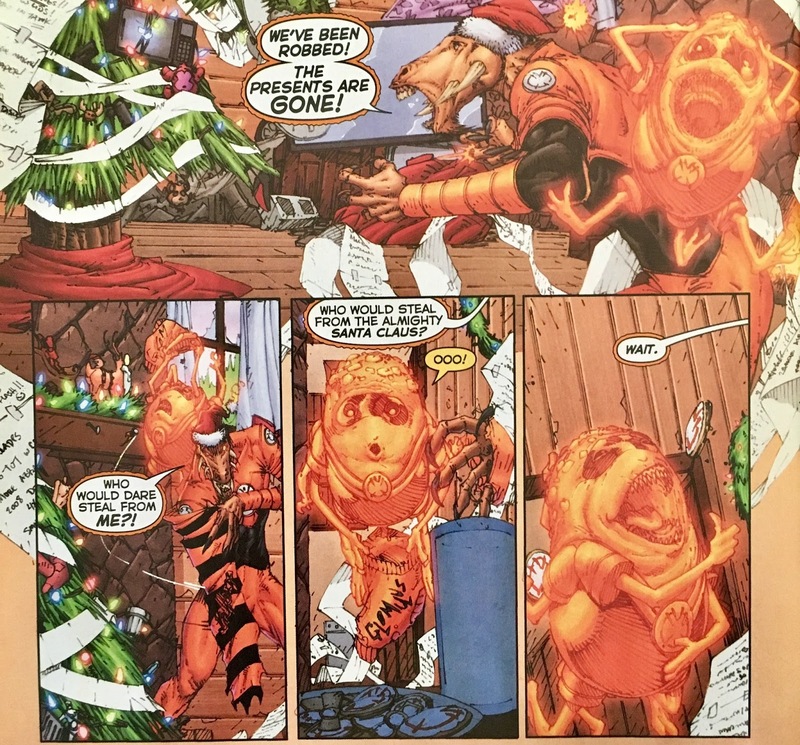 We open on Christmas Eve with Larfleeze admiring his ramshackle Christmas Tree. 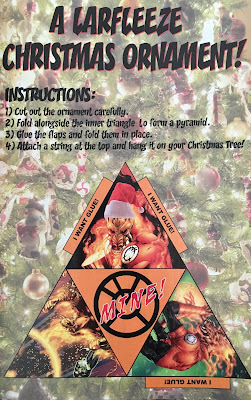 There's a lot of neat detail on the tree... it's full of things he'd "acquired"... mailboxes, mannequin parts, a jack-o-lantern, remote controls, a toilet seat... toilet paper, everything (including) the kitchen sink! 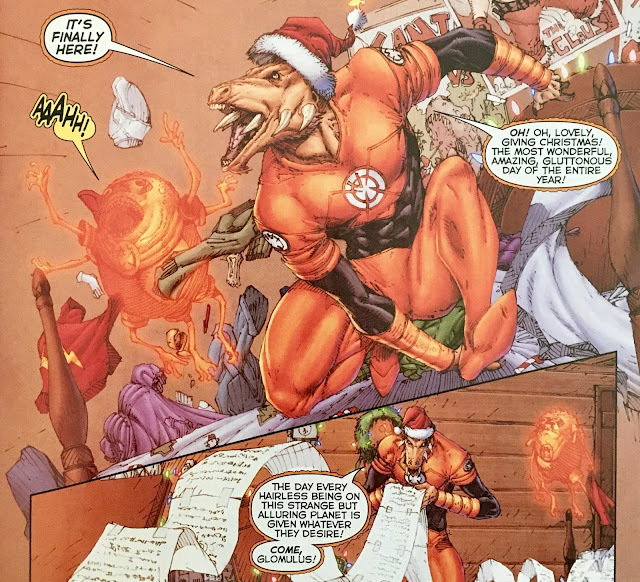 We shift scenes to the next morning... and Larfleeze realizes that it's Christmas.. and the great guardian Santa Claus will have visited and brought him everything on his list! And so, he grabs Glomulus and heads downstairs to find... nothing?! 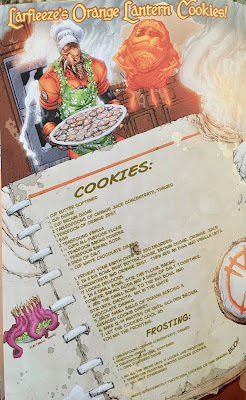 Not a single gift under the tree... and what's worse, the Christmas Cookies (recipe below) he'd left for the Jolly Guardian were left uneaten. This must mean that Santa never showed up! As he paces and rages, Glomulus directs his attention to the television... where they can see Santa Claus taking part in a parade. Next stop... some city! 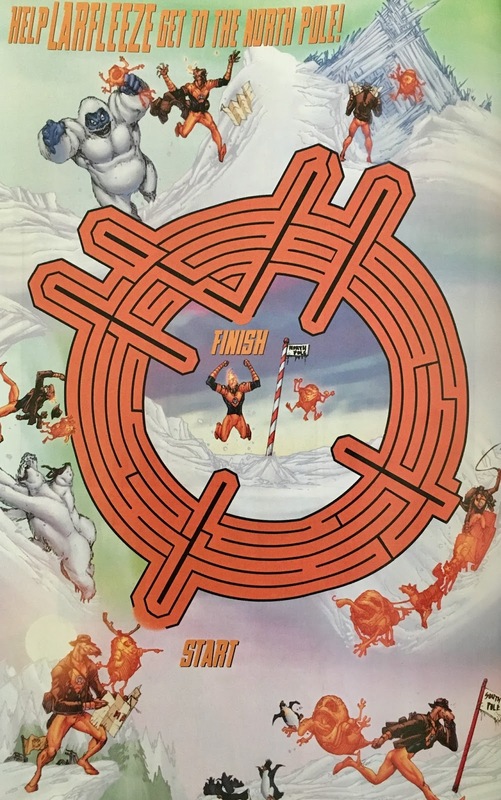 He grabs Santa in his orange energy beam-thingie, only to learn that this man... is an impostor! He looks to the ground and sees yet another Santa... heading into Dee Cee's Department Store. Larfleeze gives chase only to find... many, many Santa Clauses?! 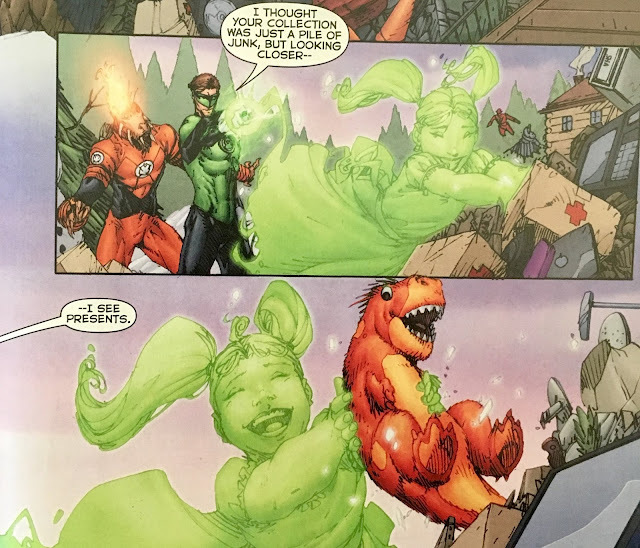 A smart-mouthed child informs Larfleeze that none of these fellas are the real deal. Everyone knows the real Santa Claus lives at the North Pole! Turns out though, we gotta help our man get there by navigating a maze. 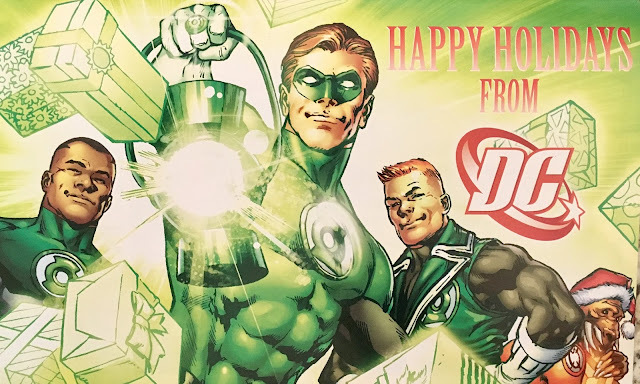 Really, Hal? I could swear you've met him a time or two! We'll allow it as it facilitates the direction the story is going... I guess. Hal brings Larfleeze back to his junkyard to try and explain the "Christmas Spirit". 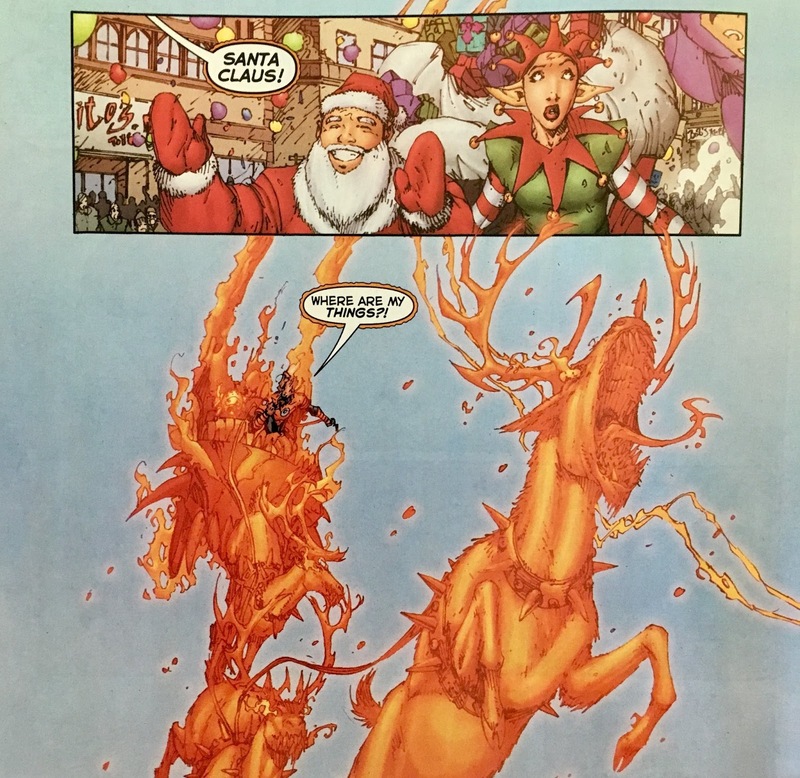 He looks among the refuse... and tells 'fleeze that he sees plenty of gifts he could give to those in need. And so, Larfleeze and Hal pretend they are Santa Claus... giving gifts to boys and girls in need. After they're done, our man realizes "Eh, maybe Christmas just ain't for me." Job well done, Hal! 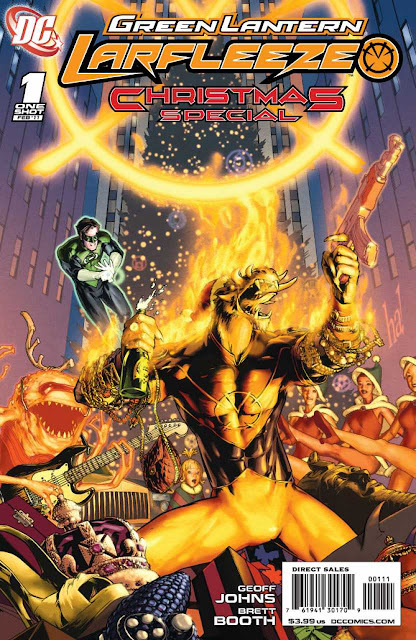 We wrap up with Hal telling Larfleeze to take a look at his list... and ask himself "Do I really need this? 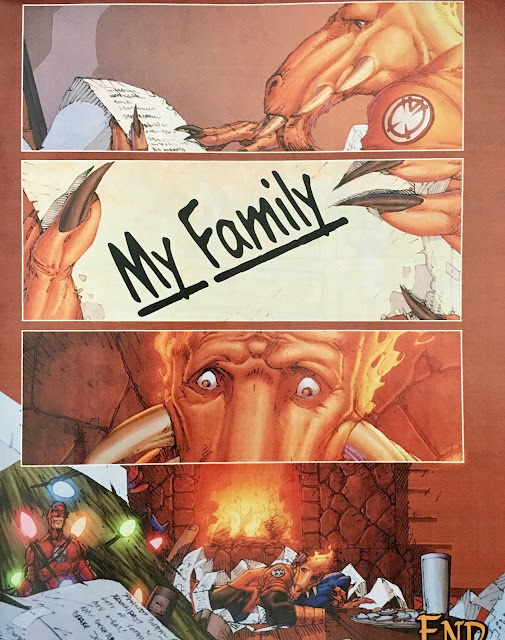 ", which leads us to our rather heartbreaking ending... one of the items Larfleeze wanted Santa to bring was... his family. Wow, talk about a bummer ending! Let's start by addressing the elephant in the room... at least for me. Where was Santa Claus? Isn't it like a Chekhov's Gun of Christmas stories, where if in Act I somebody says "there's no such thing as Santa Claus", that means Santa will most definitely be appearing during Act III? We unfortunately don't get that here. That's certainly not the way I would've written it. I figure if I'm not planning on having Santa show up, I'm steering clear of the "reality" of it. Sure, maybe have some skepticism, but don't outright say anything. 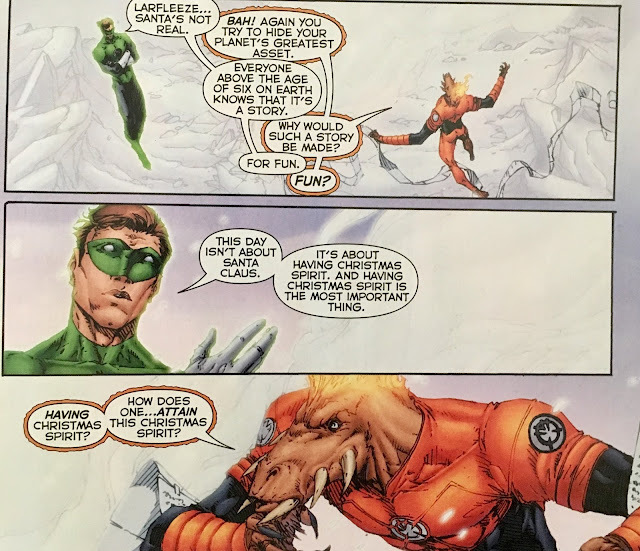 I think I'd have ended this with Santa popping his head into Larfleeze's house, seeing the list, then quietly slipping out... or, maybe having Santa thank Hal for convincing Larfleeze that he's not real... because there's no way he'd be able to get him everything he wants? I dunno. I get that this is more of a "Christmas Spirit" endeavor, and not necessarily about the Big Guy... but I always worry when I read or watch something that might cause little kids to second-guess Santa. That magical time in our lives is already so short... why risk shortening it even more by reading something that plainly says it. Anyhoo... despite that sticking point (and it is a sticking point), I really quite enjoyed my time with this. Larfleeze first showed up during my extended unemployment, so I missed out on many of his early appearances the first time around. 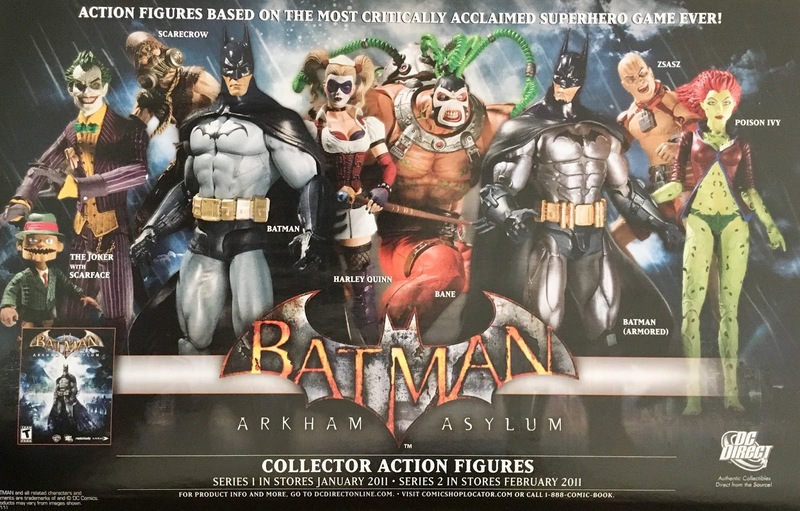 In fact, when I saw this on the racks I thought "Wow, there's a turn I never expected G'nort to take! ", so I really wasn't hip to his character beats. This is probably as comprehensive a look at him (minus the fighting) as we're going to get... he's greedy... doesn't understand what "giving" is, and sure doesn't derive satisfaction from it... and he misses his family. He also has a dynamite recipe for Christmas Cookies (see below)... so there's that too. Speaking of the cookies... 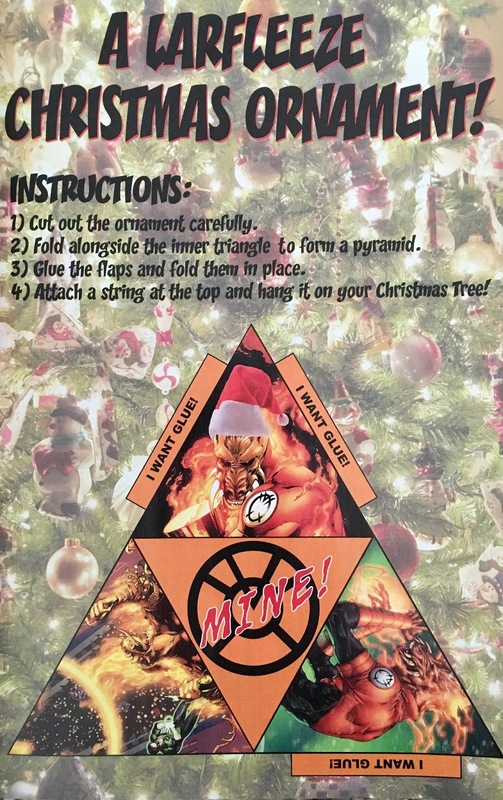 I dug that they included a few "activity" pages here. It made the issue feel like an old-time special... really pulled me into the book. Also... the art here was fantastic! This is a gorgeous book... so often "Holiday Specials" have a phoned-in feeling... this one most definitely did not. Overall... despite Hal being a killjoy, and the lack of Santa made it feel like I was holding in a sneeze... this was a great little special. I'd recommend it (to folks old enough to be "unburdened" by childhood wonder). It's available digitally. 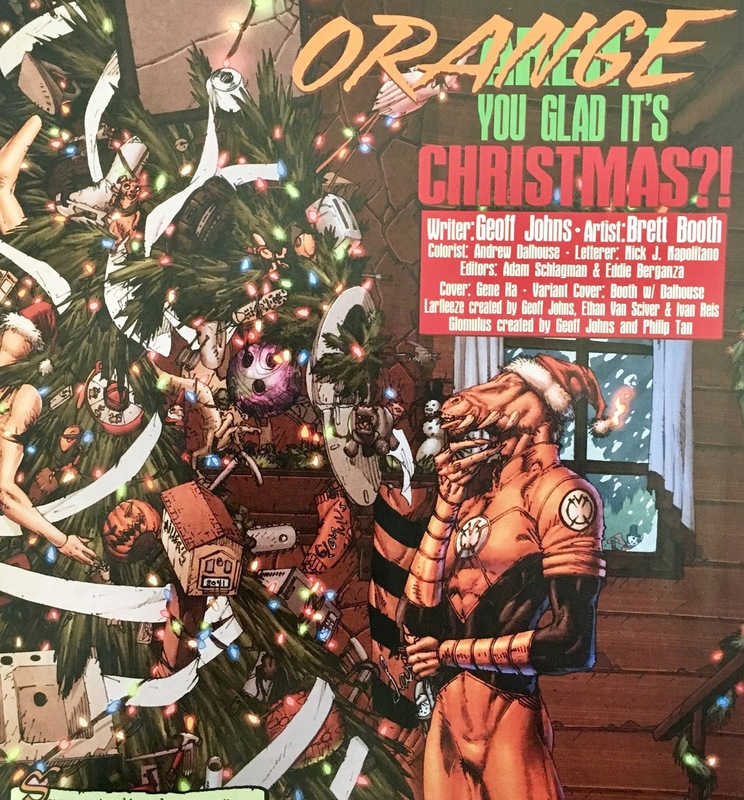 On the Second Day of Christmas on Infinite Earths, I give to you Green Lantern: Larfleeze Christmas Special, and a Red Hood and the Outsiders Annual #2 Review.